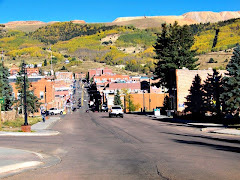 Here are several photos of my town, Cripple Creek. 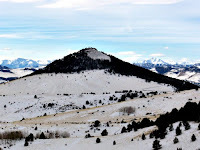 The mountain peak in the top left is Mt Pisgah, very distinctive and prominent. Our cell phones and internet distribution towers are on top of this peak, so a lot of us are dependent on line of sight with Mt Pisgah! The Jail Museum opened up this late fall, it has been restored and there are actual cells within its walls....we used to have Boy Scouts Haunted Houses in there back in the early 1990's, it was certainly a creepy cold box then but is definitley an interesting and worthwhile tour! There is a gift shop inside also! 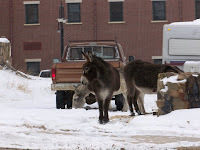 Here are a couple of photos of the towns most distinguished residents, the Donkeys! They are notarious and world renown! These little guys (or, their ancestors) are symbols of stability and dependability in Cripple Creek...they helped develop the District and packed many a miner and his tools up to and into the mines which made Cripple Creek the Worlds Greatest Gold Camp! 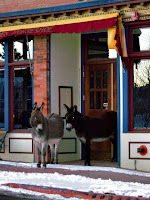 Every year we celebrate their brayiness with Donkey Derby Days the last full weekend in June. We have a great parade, kids activities and street vendors and Donkey Races and lots of other foolishness that goes with a towns summer festival! 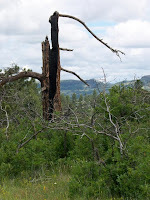 This year promises to be awesome with a new line up and a healthy injection of funds into supporting the event, starting off with a Chile Cookoff June 20 2008 then the Donkey Derby Days starting June 27 2008 then ending with a BIG finale of Fireworks on the 4th of July. We have awesome fireworks and great visibility! I run into these guys to the right very often on my drive into town. This herd has been around for years and lives in a protected area known as Dome Rock State Wildlife Park. 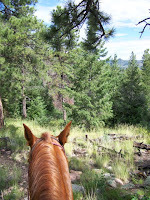 It is just over the hill from Teller County Road #1 that I use to get to town. 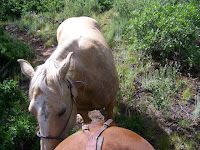 They come down to the road as it is warm and lick the salts and nibble on the exposed grasses. They are very cool! 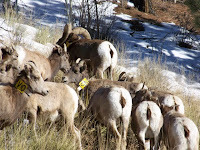 Rocky Mountain Sheep! 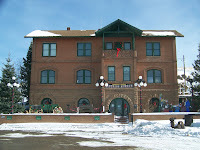 To the left is a photo of the Train Depot. 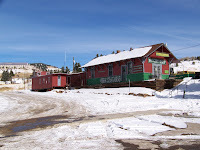 That train runs a short 45 minute guided tour up the mountain on narrow gauge and open cars, with a coal fired locomotive every spring and summer. We all know it is spring when the smell of coal drifts through the air and we hear the whistle blow! The middle photo is of our County Courthouse, built in the late 1890's and housing our valuable records, it is great to walk inside and check out. The building had some renovations last year to the interior. The courtrooms are authentic, the Assessors, Clerks, and Treasurers office are all authentic with some minor modifications for the computer age! This is right across the street from my office! Upper Right Hand corner is the District Museum. 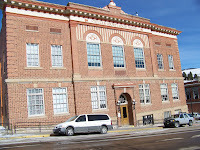 This building houses many archival pieces of interest for you History Buffs, all original to the District. 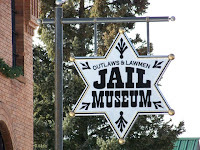 Well worth the visit and the minor donation it takes to tour the place, you will see many photos, pieces of equipment, clothing and more original Cripple Creek pieces! 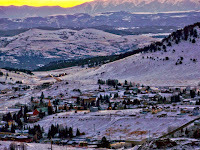 Finally I will end this short tour with a photo overlooking Cripple Creek, taken at sunset this month. The distant mountain range is the Sangre De Cristos, one of the many you can view as you drop into town off of Tenderfoot Hill. Thats the town below. Quaint and quiet? Ha ha ha NOT! Come and see for yourself!